If you’re in North Carolina this weekend, there are some great Hip Hop events that you won’t want to miss in the Triangle. 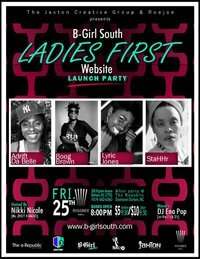 Friday night, you can check out the B-Girl South Website Launch Party in Durham featuring an all-star, all female line-up including: STAHHR, ADRIFT DA BELLE, LYRIC JONES & BOOG BROWN. Saturday Morning in Chapel Hill join BRIAN DAWSON, KING MEZ, UPRITE LIONS and THE BEAST at the 5th Annual Hip Hop Symposium on UNC’s campus. Then Saturday night check out 9TH WONDER’S IWWMG/Jamla showcase featuring BIG REMO, TYLER WOODS, TOM HARDY, ACTUAL PROOF & RAPSODY at the Brewery in Raleigh. Damn I love NC!